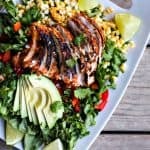 I’m so happy to present my newest recipe in partnership with Shenandoah Valley Organic chicken; Super tasty, super simple, Spicy Southwestern Chicken Salad and Meal Prep Bowls: This three-for-one gives you an amazing batch of tantalizing Spicy Southwestern Chicken, a dinner salad recipe using the chicken, and meal prep bowls using both the chicken and the salad! I love to grill our chicken for that hint of smoke that grilling imbues, but a grill pan will cook it up pretty darned well, too. While I’ve got the grill or grill pan hot, I roast a couple of ears of sweet corn and a jalapeno pepper. This concentrates the natural sweetness in both of them and intensifies the best parts of their flavours. The corn is cut away from the cob, and that concludes the hard work. The rest of this meal includes simply arranging salad greens over a platter, tossing the rest of the vegetables over that, and slicing the chicken breast before topping the whole works with it. Mercy. It makes me so happy. How about dressing? Well, to be honest, I think this salad is flavourful enough to do without it. The chicken is practically exploding with flavour, and -when made with Shenandoah Valley Organic boneless, skinless chicken breast- is plenty moist enough not to require a dressing. Between that, the creamy avocado, and the squeeze of lime juice, you’ve got a party going on right there. If you’re a hard-and-fast dressing lover, though, a nice homemade Ranch dressing or this Ninfa’s Green Sauce would be lovely or you can use your favourite dressing! 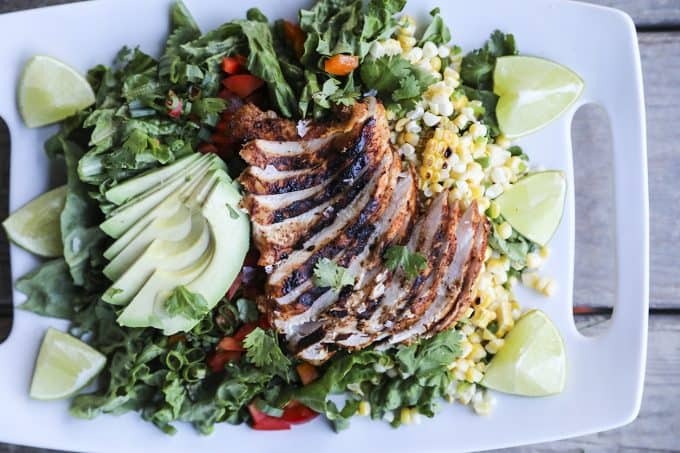 This converts BEAUTIFULLY into Spicy Southwestern Chicken Salad Meal Prep Bowls. How so? Follow all of the instructions up to the point where you’ve tossed together the roasted corn and diced jalapenos. Cover the chicken in an airtight container and pop it into the refrigerator. Now divide your greens between 5 large-ish containers with tight fitting lids. Divvy the roasted corn mixture, bell peppers, green onions, cilantro leaves, and lime wedges between the containers. Snap the lids in place and refrigerate the works. 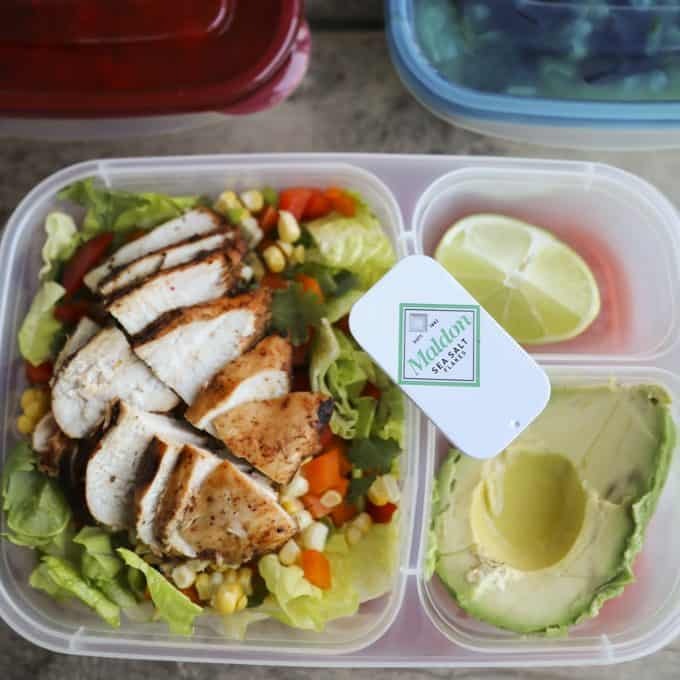 When it comes time to pack your lunch, you open one salad, slice the chicken breast and lay it on top of the greens, scoop half of an avocado from its shell and into a corner, squeeze half a lime over the avocado, and lock the lid in place. Now slip your Spicy Southwestern Chicken Salad Meal Prep Bowl and a little container of salt into a cooler bag for later. Shoot. I wouldn’t blame you if you skipped the cooler bag and just ate the salad right then and there. 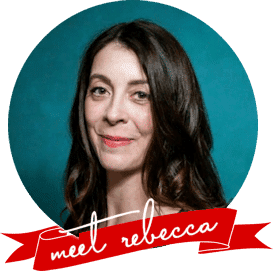 If you exercised will-power, though, all that’s left is to open your salad, squeeze the lime wedges over the top, sprinkle with a little coarse sea salt, and dig in. 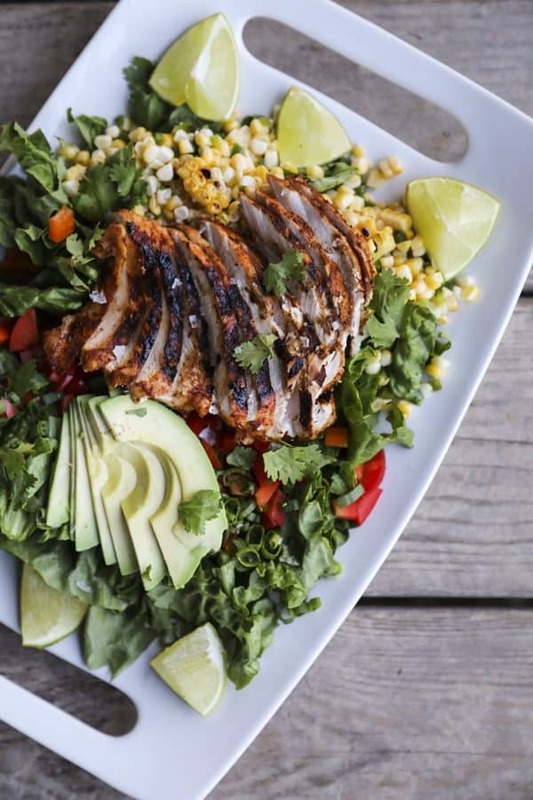 You’re going to be so happy you made those Spicy Southwestern Chicken Salad Meal Prep Bowls. Don’t marinate the chicken for longer than 2 hours. The reason for this is that the marinade is acidic. Acidic is good in terms of speed of delivery of flavour, but is a time bomb; let the chicken sit in it for more than 120 minutes, and it will start breaking down the fibers of the meat. The end result will be mushy or oddly textured chicken if it marinates too long. If you’re desperate to get a jump start on flavouring the chicken, but the clock is against you, you can add everything BUT the lime juice and vinegar to the bag with the chicken and proceed as directed. With the spices, oil, and garlic on it, the chicken can sit like that for 24 hours to 48 hours before adding the vinegar and lime juice. Again, though, once that acid enters the picture, you have 2 hours max before cooking. Look how easy it is to make Spicy Southwestern Chicken! Add all of the ingredients for the Spicy Southwestern Chicken to a re-sealable zipper top bag. Squeeze as much air as possible from the bag while sealing it. Squish the bag to evenly coat the chicken in the marinade ingredients. Marinate the chicken in the refrigerator for at least 20 minutes but no longer than 2 hours. Preheat a gas grill to MEDIUM HIGH or place a greased grill pan over a MEDIUM HIGH burner. Using tongs, lift the chicken breasts from the marinade one at a time, letting excess drip away. Arrange the chicken over the grill or on the grill pan and cook for 4 to 6 minutes -depending on the thickness of the chicken breast- until the internal temperature reaches 165°F. Transfer the chicken to a plate and let rest, lightly tented with foil, for 5 minutes before slicing to serve on the salad or transferring to an airtight container to store in the refrigerator for up to 5 days. Brush the corn all over and both sides of the halved, seeded jalapenos with oil. Again, on a MEDIUM HIGH grill or grill pan, arrange the corn and jalapenos, turning frequently until some areas are lightly charred. Transfer to a cutting board or plate to cool until it is comfortable to handle. Standing one corncob on its end at a time, carefully slice away the roasted corn kernels. Set aside. Slice the roasted jalapenos into thin strips, then crosswise into a small dice. Toss the corn and jalapenos together. Arrange the chopped or torn greens on a large serving platter. Scatter the jalapeno and corn mixture evenly over the greens. Arrange the bell peppers, green onions, and cilantro on top of the jalapeno and corn. Divide your greens between 5 large-ish containers with tight fitting lids. Divvy the roasted corn mixture, bell peppers, green onions, cilantro leaves, and lime wedges between the containers. Snap the lids in place and refrigerate for up to 5 days. When it comes time to pack your lunch, open one salad, slice one chicken breast and lay it on top of the greens. Scoop half of an avocado from its shell and slide into a corner of the container, squeeze half a lime over the avocado, and lock the lid in place. Pack the Spicy Southwestern Chicken Salad Meal Prep Bowl and a little container of salt into a cooler bag for later. Squeeze the lime wedges over the chicken and salad then sprinkle with Maldon Sea Salt Flakes and enjoy! This looks amazing! I’m not familiar with this brand of chicken — I’m going to look for it next time I’m at the store! It is easily the best commercially available chicken I’ve ever cooked. I love salads like this, especially the grilled veggies. Yum! 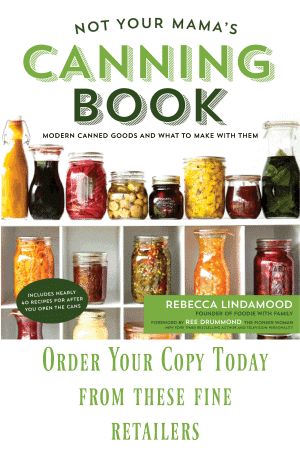 This is gorgeous and that Maldon on top – yessss!